This book is designed for the way we learn. 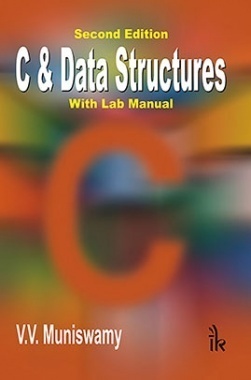 This text is intended for one year (or two-semester) course in “C Programming and Data Structures”. This is a very useful guide for undergraduate and graduate engineering students. Its clear analytic explanations in simple language also make it suitable for study by polytechnic students. Beginners and professionals alike will benefit from the numerous examples and extensive exercises developed to guide readers through each concept. Step-by-step program code clarifies the concept usage and syntax of C language constructs and the underlying logic of their applications. Data structures are treated with algorithms, trace of the procedures and then programs. All data structures are illustrated with simple examples and diagrams. 1. Contains a rich suite of end-of-the-chapter exercises, which includes multiple choice questions, questions and answers, and review questions and problems. 2. Each chapter has a lot of worked examples and detailed programs for a better understanding of the subject matter. 3. Includes 4 appendices explaining number systems, the ASCII character set, commonly used library functions, and key to the MCQs. 4. A laboratory manual is provided at the end of the book for practical application of the programs.